Hello Loves! Today I have the pleasure of showing you one of the Glam Polish Limited Edition Holo Gift Boxes that will be available for purchase from www.GlamPolish.com.au on November 7, 2014 at 10am PST. When Glam Polish says "Limited Edition", they aren't kidding. There will only be approximately 130 boxes available (combined full size and mini) and these four gorgeous polishes are only available through the boxes. There will be three box options available for purchase. #1 Mini Gift Box - four mini size limited edition holographic polishes (Elf, Bad Santa, The Polar Express and Nightmare before Xmas), moisturizing red velvet lip balm, mini cuticle balm, gold tear drop and round holo nail studs. This box is perfect as a gift for family or friends who haven't tried Glam Polish yet or any lover of mini polishes. Cost $23.95 AUD (approx. $20.89 USD). #2 Full Size Gift Box - two full size limited edition holographic polishes (Elf and Bad Santa), moisturizing red velvet lip balm, mini cuticle balm, gold tear drop and round holo nail studs. This box is a must for any serious collector or lover of Glam Polish! Cost $25.95 AUD (approx. $22.64 USD). #3 Full Size Gift Box - two full size limited edition holographic polishes (The Polar Express and Nightmare before Xmas), moisturizing red velvet lip balm, mini cuticle balm, gold tear drop and round holo nail studs. Another box that is perfect for serious collectors or lovers of Glam Polish! The box comes wrapped in bubble wrap with the box option on the seal. Under the bubble wrap is an adorable black box. Ok, ok...fine. Under all that crinkle paper you'll find the goodies. A pretty purple bag containing the polishes, a mini cuticle balm, the Red Velvet Moisturizing Lip Balm, and a little baggie of gold tear drops and silver holographic studs. A little more unwrapping and we're ready to start reviewing! Whew...finally there. These little mini bottles are so cute! The Red Velvet Lip Balm is very nice. I'm not sure if I've mentioned it before, but I'm a total lip balm junkie. I have almost as many lip balms in my purse as I have cuticle oils, and that's a ton! The ingredients are simple which I really like: coconut oil, cocoa butter, beeswax, castor oil, shea butter, vitamin E and flavor oil/extract. The balm itself has a very light fragrance and flavor and leaves your lips feeling like silk. I also adore that it doesn't have a strange aftertaste like so many commercial lip balms. I have a feeling this balm will be a favorite this winter. I may need a few backups! The Cuticle Balm is very interesting. In this case, interesting is a great thing. I'm not usually a big fan of cuticle balms because they feel heavy and greasy to me. This balm is neither heavy or greasy. In fact, it's more like solid oil in a pot. The heat from your fingers instantly turns it into an oil that is easy to apply and absorbs quickly. It is also unscented, so its perfect for those who are sensitive to the heavily fragranced oils and balms out there. The ingredients are fabulous too: apricot kernel oil, sweet almond oil, beeswax, jojoba oil, coconut oil, vitamin E and honey. Elf is a forest green holo with gold and silver shimmer and flakies. The holo in this one is less of a rainbow but highlights the various green tones. It is a bit subtle but gorgeous none the less. Like Bad Santa, application was great and this could easily be a one coater. I swatched two coats with top coat below. The Polar Express is a bright blue (I would call it royal blue) holo with icy silver shimmer and flakies. This one is my favorite by far. Yeah, imagine that...a blue is my favorite. lol The holo is subtle in this one as well and is less of a rainbow but covers the range of blues. Application was nice and this too could be a one coater. As with the others, I swatched two with top coat below. Finally, Nightmare Before Xmas is a rich purple holo with golden shimmer and flakies. This one has the strongest holographic effect of the four and is easily my second favorite. Surprise, surprise...Nightmare Before Xmas applies like the others and could be a one coater as well. I swatched two coats with top coat below. Since I played with my camera settings again to improve my color accuracy, I lost some of the holographic effect in my photos. So here's a swatch stick photo that shows a bit more of their full potential. 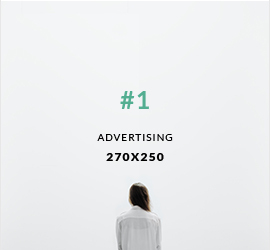 You really need to see them in person, though. They are all so stunning for their own reasons. Finally, let's talk about the studs. The gold tear drops are similar to some I have used in nail art here in the past, so I decided to try out the silver holographic studs instead. I started with a base of The Polar Express. I then added chevron nail vinyls and and a coat of Nightmare Before Xmas. After removing the nail vinyls, I added a layer of top coat and a silver holographic stud. The rainbow from the studs is super hard to capture in a photo, but you can see the prism effect pretty well on the pinkie nail. It is much stronger in person. Don't forget, these polishes and boxes are limited edition and limited quantities are available. Grab yours before they're gone from www.glampolish.com.au on November 7th at 10am PST. Be sure to follow Glam Polish on Facebook, Instagram and Pinterest to see future collections and more swatches from these limited edition boxes! 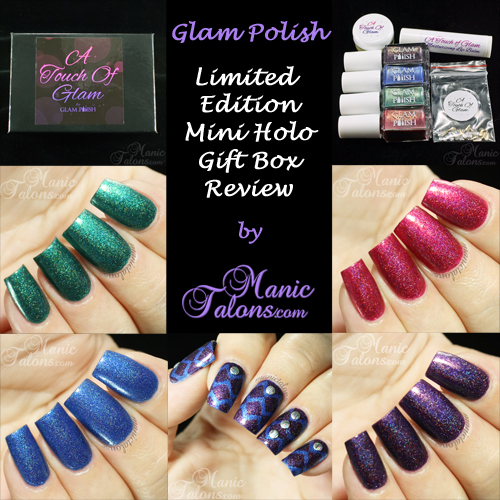 *The Mini Holo Gift Box featured in this post was provided by Glam Polish for my honest review.